When your career involves quoting other people, it can be difficult to come up with noteworthy witticisms of your own. Why would you? That, and cat videos, is why we have the Internet. I find myself pondering endings and punctuation this week, as the Redoubt Reporter ceases publication with this issue. It’s a comma, rather than a period. One of those middles about which Herbert and Frost spoke. At best, each and every error has been a learning experience. At worst, they are mistakes I don’t have to repeat. But even though we’re on hiatus for a while, I don’t consider that a failure. It’s a failure to continue to print regularly, perhaps, but that doesn’t negate the success we’ve had along the way. If something you read in the paper informed, entertained or touched you in some way, it’s been a success. If we have added to community knowledge, dialogue and record, it’s been worthwhile. If any clippings found their way onto refrigerators, into scrapbooks or the mail to or from a grandmother, it will live on. Photo courtesy of Elaine Howell. 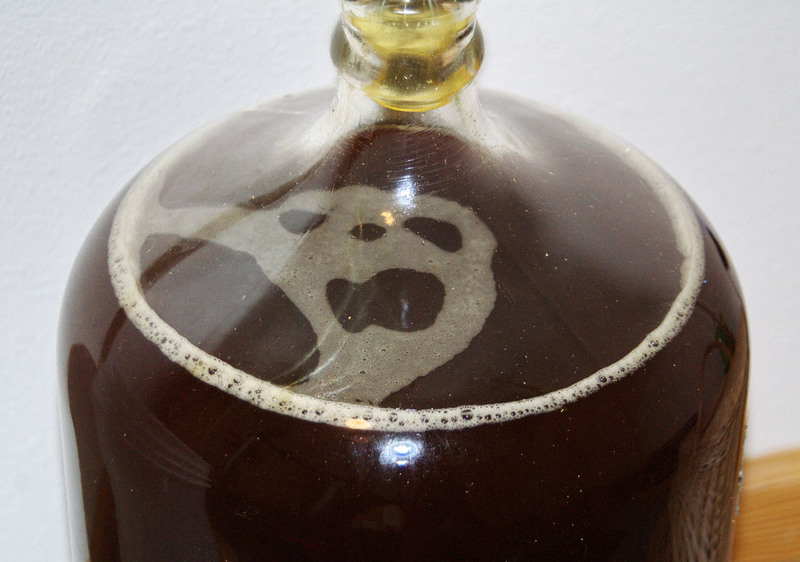 Homebrewing can be as much about social interaction as chemical interactions, especially in small towns. Author’s note: Except for the swimming part, the following is true, but some of the names have been changed to protect the innocent, plus several other people who are nearly innocent. 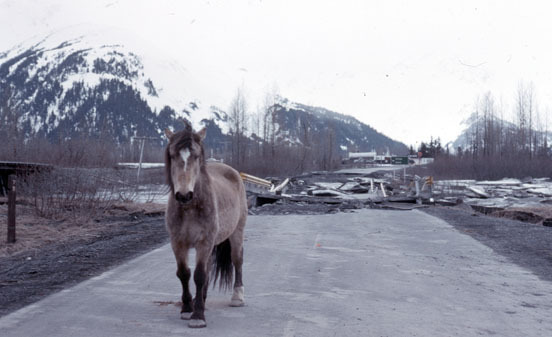 About 70 years ago — when today’s cities of the central Kenai Peninsula were no more than villages or scattered clusters of buildings along a new and sometimes barely drivable Sterling Highway — goods and services could be scarce. Winter mail had only recently been arriving by dog team. Fresh fruits were rare, and expensive. And a nice, cold beer might be found only many bumpy, uncomfortable miles away. So it’s no wonder that those who enjoyed a sudsy adult beverage now and then began making their own and sharing their product with friends. In Bush Alaska today, where a liquor store may charge more than $40 for a case of Budweiser and nearly $20 for a six-pack of IPA, it’s also no wonder that residents have taken to producing their own. In retrospect, then, it should have been no great surprise to discover a thriving beer-making culture in place when I moved to Southwest Alaska. The bigger surprise came in learning of the quasi-covert nature of this solo, yet highly social endeavor. I first heard about the Dillingham International Swim Club a few days after I’d moved to town. Photo by Jenny Neyman, Redoubt Reporter. 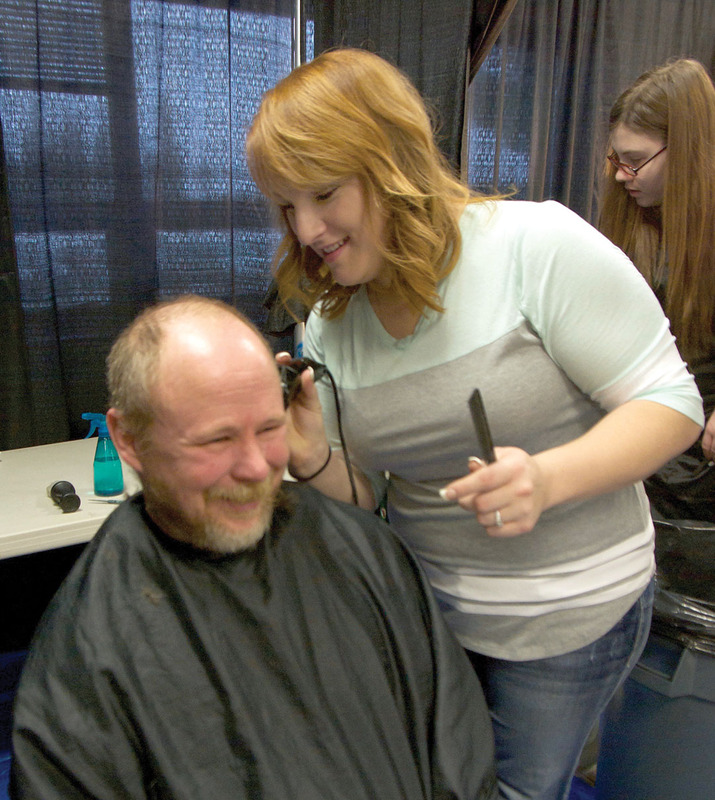 Trista Cavallo cuts hair and boosts spirits at Project Homeless Connect held Thursday at the Soldotna Regional Sports Complex. It’s a little hard to say what the best-case scenario for Project Homeless Connect would be. 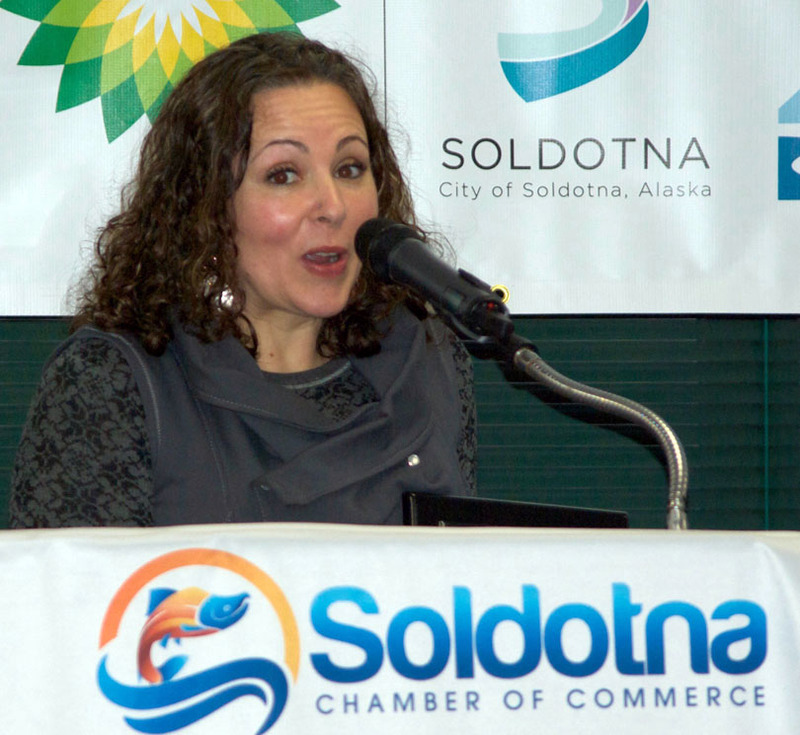 One of the organizers, Lisa Roberts, said they had more people than ever come to the fourth annual event, held at the Soldotna Regional Sports Complex on Thursday. But, ultimately, Roberts would rather have no one show up because no one in the community was homeless. That’s unfortunately not the case. “We do know that there is a lot of things going on around us, that we’ve had a lot of words of layoffs and that sort of thing from different big corporations, so I think that could be a part of it,” Roberts said. As the name implies, Project Homeless Connect links people lacking adequate housing with a variety of services. Those in need can come speak to representatives of various agencies and nonprofit organizations that help with housing, food, mental and physical health, disabilities, transportation, employment, child care and much more. This year they added a veterinarian to give vaccines to service animals, as well as a musician proving some background ambiance. The clothing donations were a hit. The booths offering haircuts and massages were occupied nonstop. “Constant. I had to tell somebody, ‘I’ll be right back, I have to go to the bathroom,’” said Trista Cavallo, one of the volunteer hair cutters. Cavallo lives in Idaho now, but was back on the central Kenai Peninsula for a visit when her friends asked her to come along and help out. “It doesn’t cost me anything to cut hair so why not do it for free for people who need it?” she said. She knew one of her customers, John, from Ministry of the Living Stones Church in Sterling. She gave him a bit of grief as well as a trim. “I thought about shaving it all and then just giving him a comb-over,” she said. “A Donald Trump look?” said John’s wife, Dre. “Yeah,” Cavallo said, while John good-naturedly sat through their teasing. Photos by Jenny Neyman, Redoubt Reporter. The shell of a home at 1211 Lilac Lane stands beyond the complete wreckage of a home at 1213 Lilac that exploded from a natural gas leak caused by the magnitude 7.1 earthquake Sunday. While the loss of four homes is nothing to be celebrated, residents and emergency responders to natural gas-fueled explosions on Lilac Lane in Kenai following the magnitude 7.1 earthquake early Sunday morning are calling the situation miraculous, since no one was hurt and everyone got out alive. Residents along Lilac Lane, Cook Inlet View Drive and Wells Way were evacuated early Sunday while emergency responders and utility companies worked around the clock to stop gas leaks in the area. The neighborhood parallels the Kenai Spur Highway on the Cook Inlet bluff side, behind Doyle’s Fuel Service, across the highway from Wildwood Correctional Facility. Misty Schoendaller lives at 1215 Lilac. She was drifting off to sleep when the earthquake hit at 1:30 a.m. She got dressed, grabbed her cellphone and headed outside. “About the time I got out the door the house next to mine exploded and knocked me back. And when the explosion happened it was really weird because it was like coming out from the kitchen area, and the front of the house kind of came out and then went back in, and black smoke everywhere. I mean, it was bad. It was real bad,” Schoendaller said. She called 911 and ran to next door to 1213 to see if she could help. Vinnie Calderon was in the front yard, shouting for his family to get outside. Miraculously, neither he, his fiancée nor the two kids in the house were injured in the explosion. This home at 1211 Lilac was one of four destroyed by natural gas explosions and fires Sunday following the earthquake. 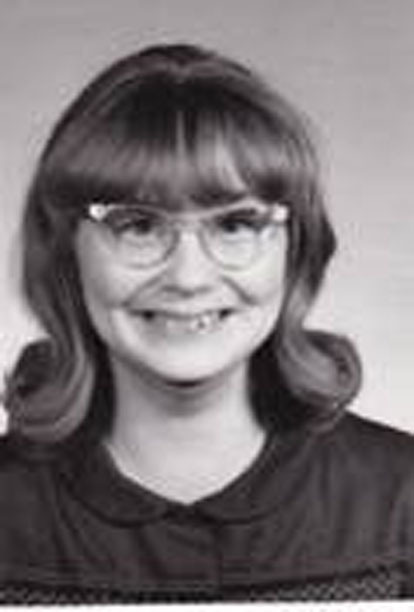 Janice Gottschalk lived there with her fiancé, brother and three kids. Janice Gottschalk lives with her fiancé, brother and three kids at 1211 Lilac, to the left of Calderon. 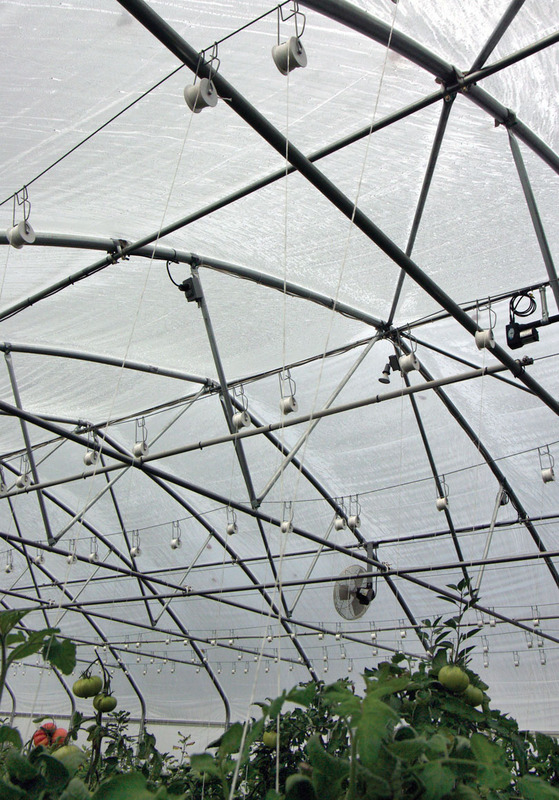 “About 1:30 a.m. the earthquake hit, and probably about 1:40, 1:45 a.m. I heard my neighbor’s house blow up,” she said. “The gas blew off the roof. They thankfully made it out. And then we were all told probably about five minutes later to evacuate our house, as well,” she said. Kenai police officers arrived within minutes of the explosion, Schoendaller said. 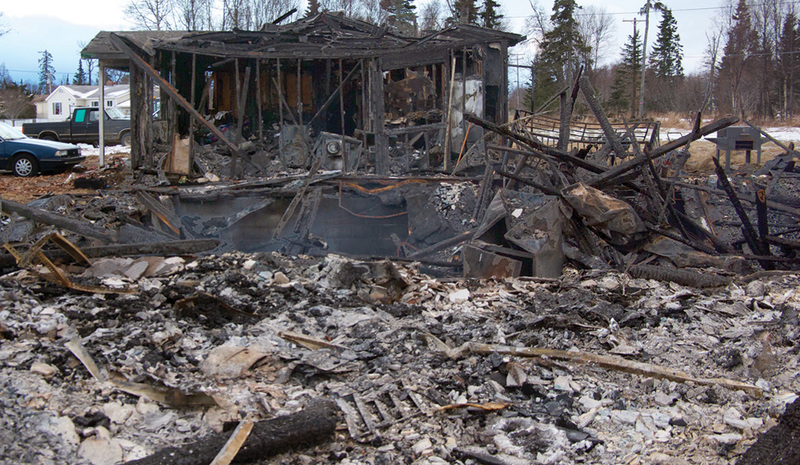 “There were things on fire outside of the house on the ground and the Kenai police were trying to extinguish it with extinguishers, and it just kept coming back,” she said. The neighbors piled into an apartment across the street as the Kenai Fire Department worked on Calderon’s house, about a dozen people anxiously waiting for whatever might come next. By 3 a.m., emergency personnel noticed a strong smell of gas in the area and told neighborhood residents they had to evacuate. 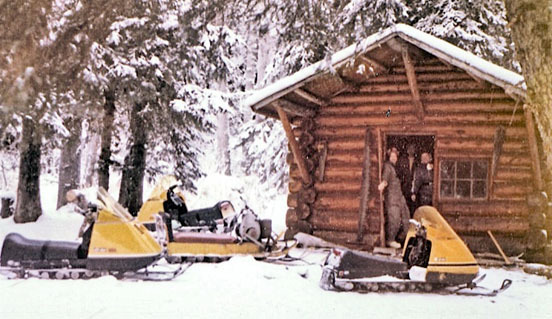 When she left Lilac, Schoendaller expected to come back to her home. “I didn’t think anything was going to happen with my house because the fire department was here and it looked like they were going to be able to contain it, so nobody thought they were going to lose their homes except that one (that exploded),” she said. An emergency shelter was set up at the Kenai National Guard Armory. Sgt. 1st Class Albert Burns got the phone call from the Kenai Peninsula Borough’s Office of Emergency Management. 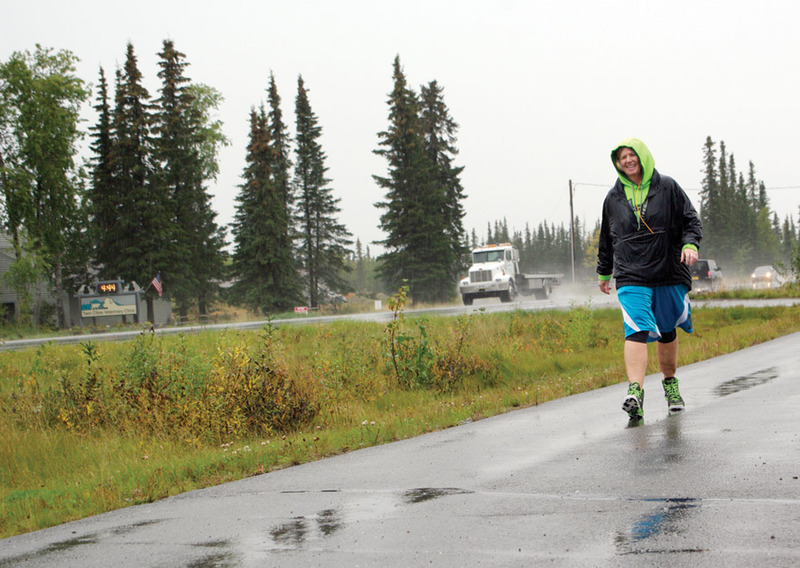 Three suicides in a month on the central Kenai Peninsula — all young adults — have sent family, friends and co-workers into a state of sorrow and shock. “You can learn a lot from those kinds of questions, but you have to be careful not to get stuck on them,” said Pegge Erkeneff, of Kasilof, speaking firsthand about coping with loss of a loved one. Sunday marked the 10-year anniversary of the date her 16-year-old-son, Justin, died by suicide. According to the American Association of Suicidology, there were 167 suicides in Alaska in 2014, the most recent year for which data is available. This equated to 22.7 deaths by suicide per 100,000 people, making Alaska the second-highest state in the nation for per-capita suicides, behind Montana with 251 suicides, or 24.5 per 100,000 people. These deaths have a ripple effect. According to the AAS, for every death by suicide, an average of 147 people are affected. Among those, 18 will experience a major life disruption. “There’s no right or wrong way to get through. I have no bumper sticker platitudes to share because I always hated hearing them. It just takes years — YEARS — for the shock to wear off,” Erkeneff said. Even 10 years later, she is still surprised at the grief that can unexpectedly come over her. “You get through it. People say you will, one step at a time, but for me, I got through crawling. My shower became my best friend. For months afterward I would stand in there, so I could be alone and cry with no one hearing. I’d stay in there ’til the water got cold,” she said. Eventually, she found that talking to others was invaluable to her well-being, Erkeneff said. “You have to walk it alone, but you need to talk to people when you’re ready,” she said. When Erkeneff started communicating with the people in her life, a picture began to present itself that otherwise wouldn’t have, especially since her son didn’t outwardly display a lot of the suicide warning signs, such as: Talking or joking about suicide, researching suicide methods or shopping for firearms, talking about feelings of hopelessness or not having a reason to live, talking about feeling trapped within their life or feeling like a burden to others, using drugs or alcohol, acting agitated or behaving recklessly, withdrawing or isolating themselves, sleeping too much or too little, displaying extreme mood swings or showing signs of rage or seeking revenge. “In an attempt to try and understand it, after he died we started talking to his friends and our neighbors, and we began to learn things we individually couldn’t have noticed. Things began to fit like pieces of a puzzle, but it was all things that we couldn’t have known. It all came after the fact, and that’s another complex thing about suicide,” she said. Erkeneff said that this is why it is so important for parents to talk to kids about suicide. “He wasn’t capable of understanding the repercussions to everyone else, the pain of his absence with everyone else,” she said. Erkeneff still lives with the pain of not having Justin in her life. She is still healing, but also is still moving forward. “The only way through is through,” she said. For those in crisis, grieving after a suicide or worried about someone hurting themselves, Careline Alaska has a 24-hour, toll-free hotline at 1-877-266-4357 (HELP), or people can text from 3 to 11 p.m. Tuesdays though Saturdays, by sending text4help to 839863. There also is a local Mental Health Emergency Line at 907-283-7511. The National Suicide Prevention Lifeline is at 1-800-273-8255 (TALK). For emergencies, dial 9-1-1. Photo by Jenny Neyman, Redoubt Reporter. 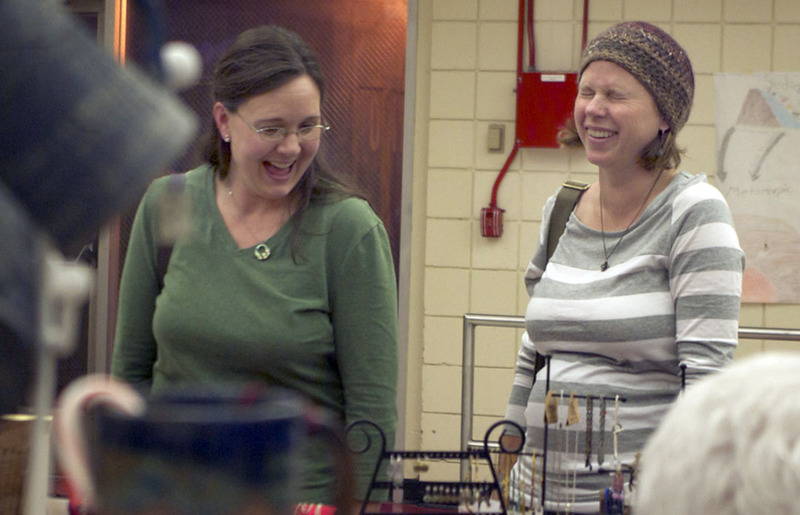 Mandy Pieh, left, and Shaya Straw attend the Kenai Arts and Crafts Fair every year to shop for out-of-state family, and to catch up with each other. For being ostensibly about commerce, the Kenai Arts and Crafts Fair, held Black Friday weekend, no less, inspired surprisingly little talk about spending money. Far higher on the list of priorities for vendors and visitors was spending time and attention on loved ones. “We come shopping here together every year. It’s our tradition,” said Shaya Straw, who was perusing the booths Friday at Kenai Central High School, in the annual fair put on by the Peninsula Arts Guild, with her friend, Mandy Pieh. For Jessica Russo, craft fair season is reunion season. “To me, this is holidays. I see people I don’t get to see but once or twice a year. And it’s just wonderful to see everybody and see new stuff. I haven’t really gotten a chance to walk around yet but I know there’s a lot of awesome stuff out there every year. It’s a good way to start the holiday season,” Russo said. She and her mom run a booth as an extension of their gift shop, The Peddler, in Ninilchik. For Russo, selling is a way of buying time with her family. The familial focus is familiar for Ashleigh Little, of Kenai Bijoux. She started selling jewelry, wine charms and jewelry board organizers about four years ago. “My husband told me to get a hobby, so I got a hobby,” she laughed. These days, she’s a stay-at-home mom to her 1-year-old son, and the business generates at least a little income for her. She’s born and raised in Kenai so loves that she gets to see so many familiar faces at the fairs. “It is fun. 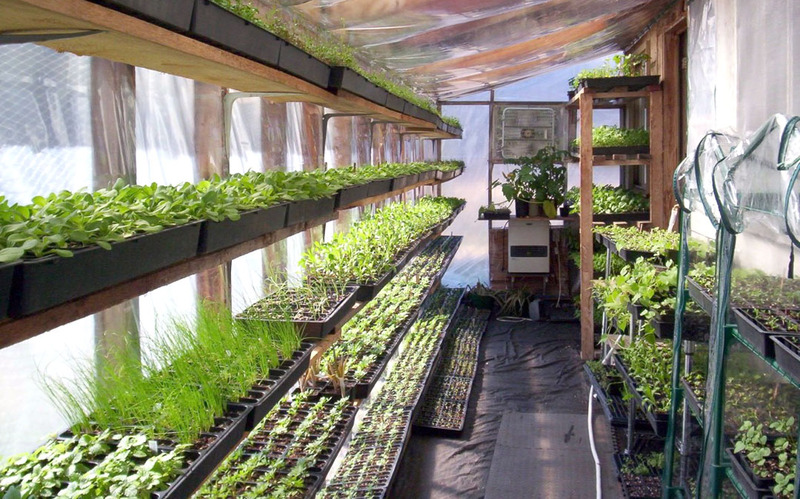 It is a lot of work, though — hauling and organizing. A lot of preparation goes into it,” she said.